Located inside Jordanelle State Park, the unique water park features inflatable water slides and other activities on the Jordanelle Reservoir. Visitors swim out to the activities. The small indoor aquatic center is a municipal facility run by the city. Attractions include a water slide, lazy river, kiddie pools, a river walk, an Olympic-size pool, diving boards, a hot tub, and an outdoor pool. The center also offers an exercise room. Cherry Hill is a small outdoor water park with attractions geared to younger children and their families. One of its highlights is Grant’s Gulch, a nicely themed lazy river in which visitors float past an abandoned mining town. Other attractions include Cardiac Canyon River Run, a tube slide, The Double Dragons, a mat slide, The Little Dipper, a racing slide with four lanes, and Pirates Cove, an interactive water play center. The water park also offers two pools and bumper boats. In addition to the water park, the family entertainment center offers dry activities such as mini-golf, a jungle-themed maze, a foam blasters arena, a rock climbing wall, Aeroball, which combines basketball with trampolines, a ball crawl, and pan for gems. Cherry Hill also has a campground with 140 sites that is open year round. Dining options include The Pirate’s Grill, Grant’s Pizza, and The Pie Pantry. Classic Fun Center is a family entertainment center with a small outdoor water park. Attractions include four water slides and a zero-entry pool with two additional sides. Other activities include roller skating, bounce houses, a jungle-themed climbing structure, a foam ball blast zone, laser tag, and an arcade. The center offers themed birthday party rooms for rent. Classic Waterpark is a small outdoor facility with water slides, a kiddie play area, a splash pad. 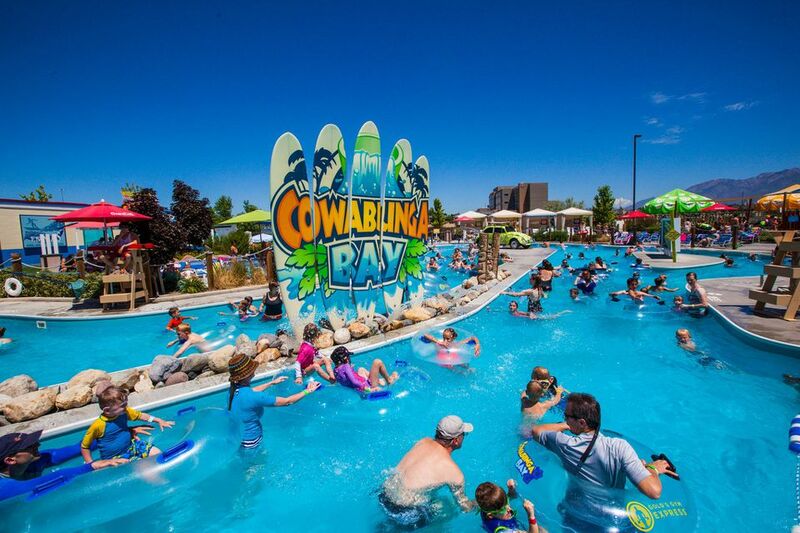 Cowabunga Bay is a medium-sized, outdoor water park. The highlight is one of the world’s largest interactive water play centers with 12 levels, over 300 water play elements, and a huge tipping bucket. Other attractions include Cowabunga Beach, a zero-depth entry pool, 11 body and tube water slides, including Mae Day, Double Dogger, and Mondo, the lazy river, Cowabunga River, and Cowabunga Kid’s Cove, a play area for younger children. The six-acre outdoor water park is included with admission to Lagoon theme park. Rides include speed slides, tube slides, a lazy river, and a play zone for younger children. The small, municipal, outdoor park offers an Olympic-size pool, a lap pool, and kiddie pool. Activities include fountain sprayers, a speed slide, and a circular slide. The center offers swim lessons, water aerobics, water safety instruction, and hydrofit classes. Seven Peaks is Utah's largest water park. Its features include the Ramblin' River lazy river, 17 water slides, including Shot Gun Falls, a wave pool, two children's pools, and an activity pool.